School Library Media Specialists and Teachers- Can we really collaborate? It’s a buzz word everywhere. You’ve seen it at ALA, AASL and every faculty in-service. If you’re like me, you’ve got it in your PIP (Personal Improvement Plan) and you start the year out with high hopes of all the amazing collaborative projects you’re going to do with the teachers in your building. Then, somewhere around October/November, you realize that your co-planning time is limited or non-existent and many of your teachers are so regimented with their schedules that they can’t see how these shared projects will actually help them in the planning, implementation, and assessment processes. We have a wide range of responsibilities and we deal with most of the people that work in our building in one way or another. 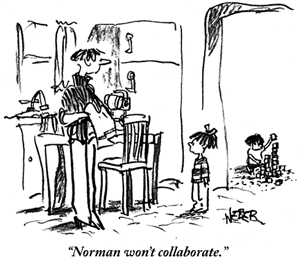 Collaboration should be our middle name, right? You would think so. I’m here to point out one reason why it might not be working and to give you some hope for looking at collaboration in a new way. One definition of the word is “To cooperate treasonably, as with an enemy occupation force in one’s country.” Sounds inappropriate for the school setting, right? I think it might be quite relevant. If we imagine the school building as a country, it’s easier to understand why teachers feel like their classroom is their ‘territory’. In my elementary school setting, the teachers are alone most of the day with their students. They bring and drop off their students to specials, such as gym, music, or media center and often feel as if another classroom is “enemy territory.” If you’re lucky enough to not be a prep coverage for that teacher, and they stay with their class, which I have for a few periods a week, the challenge becomes involving that teacher in the lesson in order to keep them from running off to make copies and phone calls, or my favorite, sitting and correcting papers. They don’t feel comfortable teaching or taking the lead in “your” classroom. We can change that. Knowledge Quest, the AASL journal, features collaboration (“Social Scholarship”) this month. Barbara Schultz-Jones’ article, “Collaboration in the School Social Network” connects the popular subject of social networking to the school setting. Seeing the Media Specialist as a social network organizer will help to make connections between the ‘territories’ within the ‘country’ of the school. The teachers will feel more at ease when things are less structured and we start with small connections between our curriculum and theirs. For example, I recently showed a video on shapes to a 1st grade class and the students responded right away saying they had just learned about shapes and engaged their teacher from the back of the room to show off their knowledge. Collaboration, in all its facets, can be successful and seamless if we take the initiative to build relationships that break down the borders. Watching students make connections between subjects, or forget they’re learning as a result of a well-planned project makes it all worthwhile. Volunteering to work on curriculum development is a great way to harvest professional relationships with teachers and curriculum supervisors (who can be great supporters of your program). Why not think more creatively about all the things we do each day that don’t traditionally count as collaboration and stop focusing on the “projects” that we aren’t able to do with colleagues. Media Specialist, Mary Alice Anderson, in her article for Multimedia Schools, “The Media Center: The Many Faces of Collaboration” suggests that we “celebrate the varied aspects of our multi-faceted roles” by including the support we give throughout the year to teachers, staff, as well as parents and the community. Do you organize the school’s book fair? How about author visits or other school-wide assemblies? Maybe you’re the “go-to” person for website help and technology issues. Our ability to help the entire school succeed is just as valid as a project we would specifically work on together. How about publicly acknowledging and praising those teachers that embrace collaboration? Students can describe how they felt learning and working that way and be your best publicity. We work hard to create an inviting atmosphere in the Media Center that feels like home to every person that enters, including students, parent volunteers, teachers, administrators and even our public librarians. We are responsible for supporting the school’s curriculum in many different ways, and with that, we have the power to break down barriers as we go along. This year, I’m going to include some of the less traditional collaborative projects in my end-of-year meeting with my principal, and make sure to quantify how many people were willing to work collaboratively throughout the year. It’s time that we advocate for our program to all who “occupy” our building. The White House Conference on School Libraries, in 2002, presented a session that is sure to inspire you to find a way to makeover your program to a dynamic, integrated media center, with you as the “information consultant” facilitating collaborative work throughout the year. The conference notes can be found at the Institution of Museum and Library Services site: http://www.imls.gov/news/events/whitehouse_2.shtm#kcl. Keep your enemies close, but your fellow collaborators closer. Entry filed under: Collaboration, Teaching and Instruction. Tags: April Bunn, media specialists, school. Great post, April. Lots to think about — wish I could have been at that White House conference!